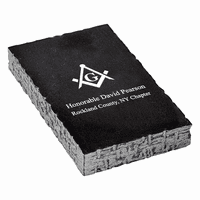 Family, friends, co-workers, or your Boss in any medical profession will be delighted to receive this handsome 3" x 5" rectangular solid black marble paperweight for the desk or shelf! It features a laser-engraved Medical Emblem on the top, with room for up to 6 lines of laser-engraved personalized text below it. It's a great gift for graduation, retirement, birthday or holiday, and comes packaged in a gift box that's ready for presentation!